Adventure Canopies LLC warrants to the original purchaser that its product will remain free from defects in material and workmanship for the term of this warranty. This warranty covers the fabric, fiberglass poles, shock cord and connectors. Adventure Canopies LLC shall not be responsible for abrasions nor the natural break down of materials that occurs inevitably with extended sun exposure or defects caused by accident, abuse, alteration, storm damage, misuse or improper care. Adventure Canopies LLC warranty applies only to the original consumer from the original purchase date with proof of purchase. This warranty is void if your canopy was mounted on a vessel other than that which designed for by Adventure Canopies LLC. This warranty is void if your canopy was structurally altered or subjected to stress beyond the physical limits of the manufactured material. What will Adventure Canopies LLC do? Adventure Canopies LLC will provide free part replacements to the original consumer with proof of purchase. This warranty does not cover the cost of labor or other consequential or incidental expenses. 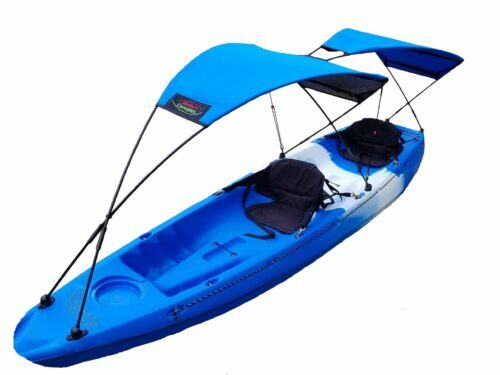 If your Adventure Canopies LLC product needs service or repair due to normal wear and tear, accident or some other reason that is not covered under the warranty we will provide the necessary service for a reasonable charge, plus shipping and handling. We require that products accepted for any repair be properly cleaned according to our recommended care instructions. 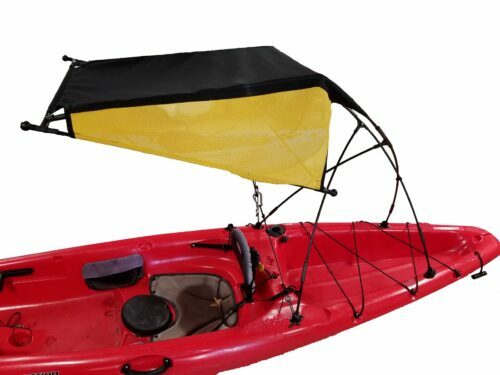 Adventure Canopies LLC reserves the right to change products and designs without incurring any obligations to incorporate any such changes in already completed products, or those in the hands of dealers and consumers. Products repaired or replaced may or may not have these changes. This warranty does not cover defects caused by improper assembly or disassembly. THERE ARE NO OTHER EXPRESS WARRANTIES BEYOND THE TERMS OF THIS LIMITED WARRANTY. IN NO EVENT SHALL ADVENTURE CANOPIES LLC BE LIABLE FOR INCIDENTAL OR CONSEQUENTIAL DAMAGES. ADVENTURE CANOPIES LLC IS NOT LIABLE FOR ANY INJURY OR MISHAPS SUSTAINED IN THE USE OF THIS PRODUCT. THE USE OF THIS PRODUCT ACKNOWLEDGES ASSUMED RISKS AND WAIVES ANY AND ALL CLAIMS AGAINST ADVENTURE CANOPIES LLC. Some states do not allow the exclusion or limitation of incidental or consequential damages, so the above limitation or exclusion may not apply to you. Other rights may vary from state to state.